Held at Dayspring’s home on Los Osos Valley Road in San Luis Obispo, attendees were asked to RSVP through Nick Andre, a co-chair of the SLO Progressives, a group co-founded by Andre and SLO mayoral candidate Heidi Harmon. Approximately 40 people attended the event, a campaign source said. The fundraiser for Harmon, SLO City Council candidates Carlyn Christanson and Erica Stewart, Morro Bay mayoral candidate John Headding, Morro Bay City Council candidate Dawn Addis, Grover Beach mayoral candidate Jeff Lee, and Grover Beach City Council candidates Barbara Nicolls and Mariam Shah, was never disclosed on the social media or the campaign pages of any of the candidates or the promoters of the event. Several partners in Dayspring’s marijuana businesses attended the event where thousands of dollars were donated to select candidates. Following the event, four candidates filed forms noting donations of over $1,000 as required by campaign disclosure laws. Two donors from the Los Angeles area, who are listed as having varied occupations, donated from $1,000 to $2,500 each to Headding, Addis, Lee and Nicolls. 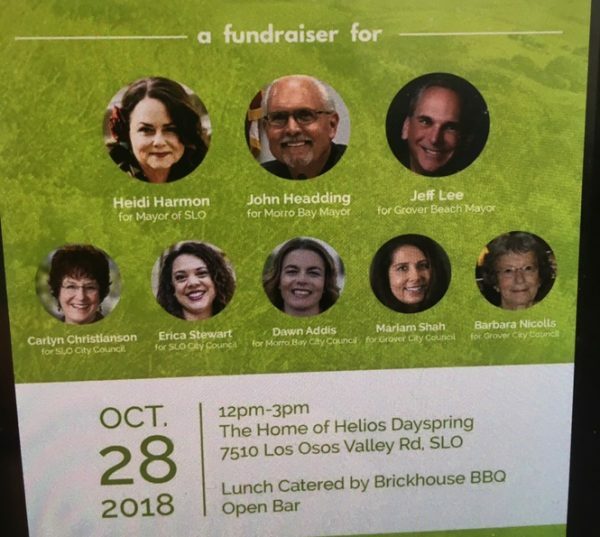 Shah declined to accept any donations at the event, while SLO City rules prohibit Harmon, Christanson and Stewart from accepting more than $300 from any donor. Donations of less than $1,000 are not required to be disclosed until Jan. 2019, while donations of over $1,000 are required to be disclosed within 24 hours. Donors Teresa and William Szymczak, donated $2,500 to Headding, $1,250 to Lee, $2,000 to Nicolls and $1,000 to Addis, according to their campaign filing reports. Lee lists the Szymczak’s occupation as the owners of Presentation Partners; Heading lists the couple as the former owners of Self Preservation Partners; while both Nicolls and Addis list the couple as the owners of Preservation Partners. The second donor is listed as either Susan Wood or Tierra Redonda LLC, an LLC that lists Woods as the CEO. Dayspring and Tierra Redonda LLC are part owners of a SLO County marijuana grow and a property in the Grover Beach marijuana zone. Lee lists the second donor as Susan Wood, and her occupation as a restaurant owner. Headding lists Susan Wood as an apartment owner, and Addis list Tierra Redonda LLC as the donor. 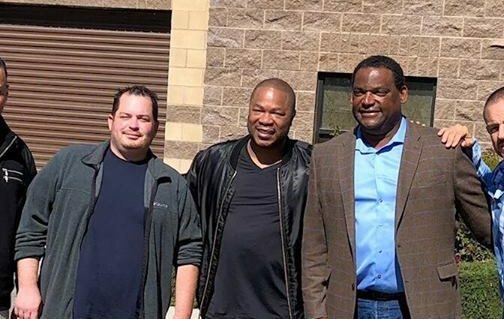 Two years ago, several marijuana business owners, members of their families and business affiliates gave multiple large donations to then Grover Beach City Council candidate Lee and Grover Beach mayoral candidate John Shoals. Following the election, Lee and Shoals, as the only members of Grover Beach Subcommittee on Marijuana, worked on a point system that promoted Dayspring and certain other marijuana business owners. At a SLO City Council meeting last month, Harmon also spoke in favor of a point system that appears to support Dayspring and several other marijuana entrepreneurs. Harmon wants to give extra points for living in San Luis Obispo, growing locally and doing community service. Before Shoals and Lee selected Dayspring’s Natural Healing Center as their top choice for a marijuana retail shop, Dayspring had been involved in a variety of controversial child-related events. In April 2017, Dayspring sponsored an Easter egg hunt in Grover Beach for children ages 1-11 where his marijuana delivery service was advertised on banners, hats and T-shirts. 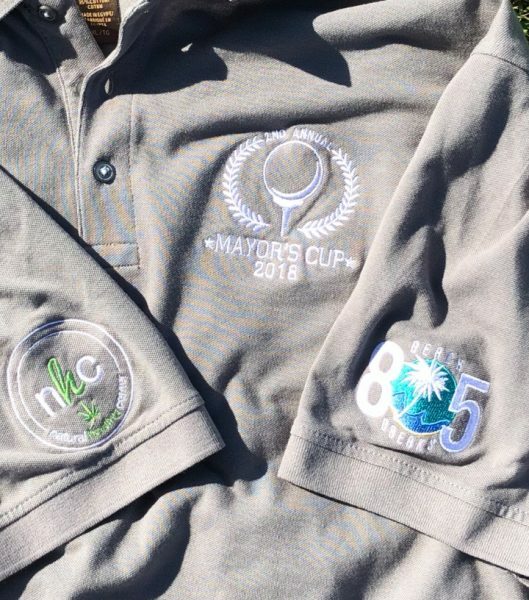 In August 2018, two marijuana shops in Grover Beach, Dayspring’s Natural Healing Center and 805 Beach Breaks, sponsored the Mayor’s Cup Golf Tournament. T-shirts given to players at the tournament advertised the two retail marijuana shops. I wonder if we were in Tennessee and the contributors were whisky dispensers, such as Jack Daniels or Jim Beam, whether all these right-wingers would be so negative. I guess the SLO County Progressive crowd will even take drug money to stay in power. Isn’t that a sad commentary on their ethics? Caren? Heidi? Adam? Aaron? Carlyn? The local progressive left politicians accept money from drug dealers to fund their election campaigns, and we should boycott them in respect to our children. I cannot support people like Caren Ray or Heidi Harmon. It appears with big money from several questionable pot sellers, all these candidates were elected. I really feel sorry for the small growers who are being pushed out by these connected few marijuana people. I’ve heard the drug dealers are even providing these whacky, far-left liberal politicians with samples of their product, and I do not think voters should elect people to public office who use drugs. Shame on these crooked politicians.